Just who is “America’s secret weapon against crime?” As his catchy theme informs, he’s a “number one super guy, quicker than the human eye!” Disguised as a mildmannered police station janitor, Penrod transforms into the powerful pooch who the girls love to smooch by leaping into the bottom drawer of a filing cabinet – and emerging as Hong Kong Phooey in a bright red karate outfit! He gets most of his criminal tips from Rosemary, the min..
Hong Kong Phooey - Volume 1. Just who is "America's secret weapon against crime?" As his catchy theme informs, he's a "number one super guy, quicker than the human eye!" 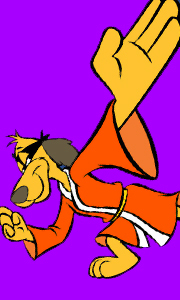 Disguised as a mild-mannered police station janitor, Penrod transforms into the powerful pooch who the girls love to smooch by leaping into the bottom drawer of the filing cabinet - and emerging as Hong Kong phooey in a bright red karate outfit! Episodes: Car Thieves Z..